Several years ago when retsoring my 27 JD I visited a guy in Sweden owning this beautiful 29 JD. 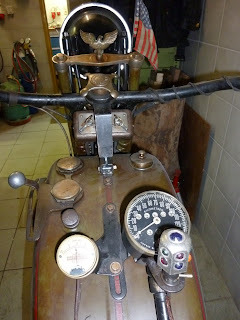 That is when I first got to know that the German Carmen-Werk AG made a steering brake for Harleys, introduced in 1928. This German company who is more known for making type writers apparently had an interest in motorcycles too. This nifty device is according to my investegations once sold by Lindhblads in Stockholm, then the Swedish Harley general agency. Several years later I was lucky enough to get a Carmen Werk steering brake for my 27too, a cool history in itself (for later). 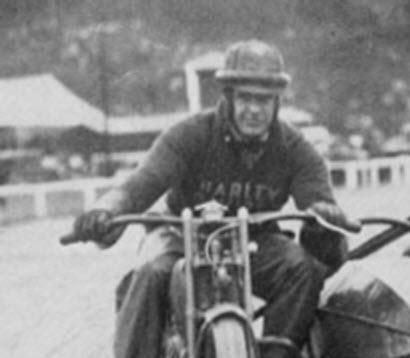 Reason for all this coming to my mind is I got a old magazine scan from Uffe (mentioned in my Ivar Liljequist post, we owe him) where "master Erik" Westerberg ride a sidecar fitted Harley in a Swedish race. 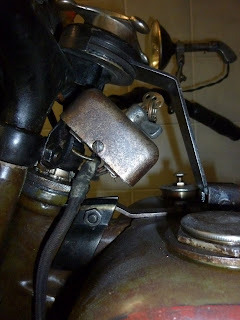 In this pic you find the Carmen Werk brake too, wich means master Erik thought this was required to improve steering during races. Cool I agree with him, it does improve handling a lot. Heinz from Austria sent me an e-mail with pics of his pride and joy, a beautiful 28 JD that gets used a lot climbing the alps. 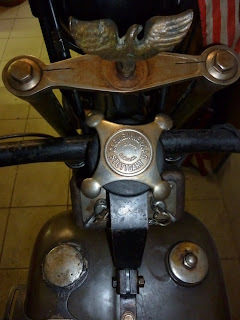 Check out the details on this old beauty, carmen Werk steering brake, the jeweled speedo lamp, the fork stabiliser, wich according to Heinz is another Carmen Werk product and her patina from years of aging. They where issued for Indian and other brands as well. It is stamped INDIAN 1929 under mine.